This is my submission to a Codepen Challenge for week 1 of March 2019. I saw this over on Facebook, and I thought it was awesome! I’ve been living with this problem a little awhile now. This problem was introduced with the last upgrade of Xcode: Version 10.0 (10A255). Help comes up for sure. Always has for me. I move my mouse over something like a class name that is part of Apple’s eco-system, like (for example): SKAction… I hold down the Option key of my keyboard… the mouse icon turns into a nifty bold question mark… I left mouse-click… a popup comes up… I click the Open in Developer Documentation link at the bottom of the popup… and Behold! 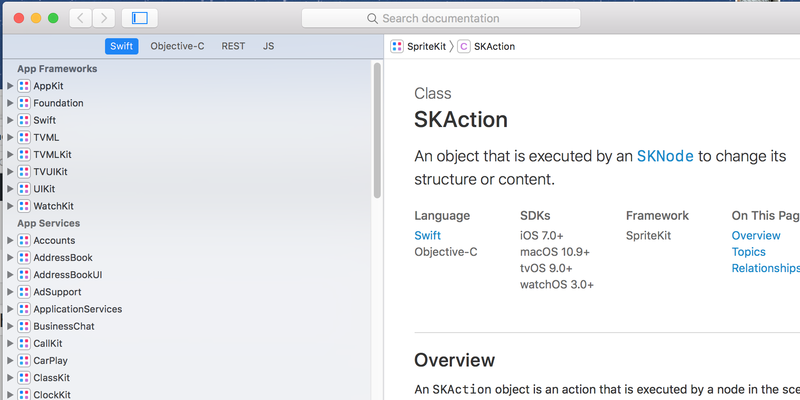 A window pops up about SKAction! But there is this tree control on the left side of the window… you know the one that I mean… and SKAction is not highlighted in it! This is annoying because by expanding the SKAction node in this tree control (for example), I can see all the methods that belong to this class. And, if I click on one of those method names, then I see the help for it. And that obviously is really handy! This used to work. Except, when you had help up from a previous search, then whatever you had selected from a previous search would be highlighted (even though the content on the right hand side of the window would be correct). Annoying, but no problem: I would just close the documentation window and re-do the [Option]-click, and the item I had picked would be properly highlighted in the tree! And I could explore all the related items to my heart’s content. The past problem was slightly annoying. This problem is Really annoying! Another annoying problem: If you pick an option in Objective C, it brings up the help for Swift. If the context is Swift, it should display the help for Swift, if the context is Objective C, the help for Objective C! I know, all I need to do is click the [Objective C] link on the page… but this is supposed to be contextual help!